Title page, watercolor painting, sewn boards binding with handmade paper and letterpress printed wood type, completed wrapper tied with string. Case binding with letterpress printed wood type on linen, prospectus. “Searching for Marjorie,” an essay by John Cutrone. Letterpress printed with vintage wooden type for titles. Page spread for letterpress printed essay, sepia-toned photograph laser printed on Mohawk Superfine. Page spread with laser printed color photographs and palm-pod illustrative elements, printed letterpress. Artist’s book, with letterpress printing, handmade paper, text, pochoir and watercolor illustrations, decorative elements printed from Royal Palm pods, hand bound in three versions. All elements are the creation of the artist. There were no boundaries. The gift of time, space, studio access and creative freedom are a heady mix, and the generosity of Helen Salzberg in conjuring this opportunity at the Jaffe Center for Book Arts was such a windfall. I had been missing the opportunity to MAKE…books, paper, printing, designing, writing, binding, teaching. So when the award notice came, I was over the moon. And so I drove across the country, all the way from the Pacific Northwest, ideas weaving their way through my mind as the miles passed. My subject was the home and environment – or what remains – of the famed writer, Marjorie Kinnan Rawlings. I had previously visited and absorbed and photographed her place, there in the Florida Cracker Country. The orange groves, palmettos, wild birds, the lake, the dust and off-the- beaten track place where she wrote and eked out a living. This quiet place spoke deeply to me, and continues to resonate over time and space. A place that felt like the essence of “home” for spirit and soul. For creation and achievement and quiet solitude. Oregon to Florida is a long and fruitful distance for developing ideas, for creative ferment. l wrote the book’s introductory narrative on the road between California and Louisiana. And on arriving at the Jaffe Center, the doors were open, the press at the ready and the paper mill and bindery just waiting for me to begin. I brought blue jeans with me from Eugene, combined them with new white linen shirts from Florida and made paper. Stencil brushes and vibrant cardinal red gouache brought a touch of pochoir, and Marjorie Rawlings’ beloved “red bird” flew off the edges of pages. Fallen Royal Palm pods supplied material for a creative approach to printing textured accents throughout. I learned to operate a laser printer for my many photographs of the farm and orange grove at Cross Creek. More visits to the farm ensued. Choosing and winnowing images was an adventure in discernment. I worked at setting type and designing pages with pencil and computer. I’ve always done things the Old Fashioned way. Setting brand new Perpetua in lead and generating computer text for polymer plates brought yet another adventure into the mix. 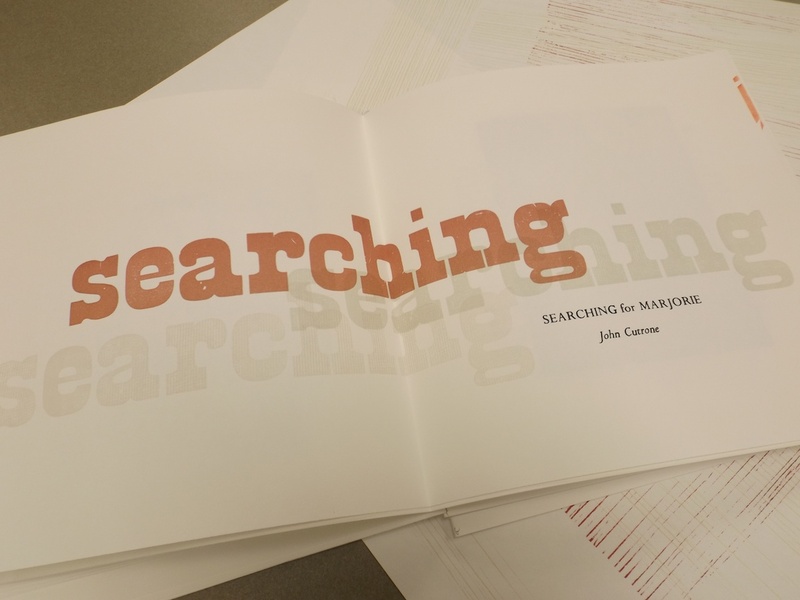 John Cutrone let me publish his charming and insightful essay, “Searching for Marjorie” in this overachiever’s project. His words are beautiful. In the AIR office, there is a painting by Helen Salzberg, the generous donor who made this Artist Residency possible. One day, having arrayed many of my photographs on the work table there, I saw that most of my photographic images were there, in that painting, The Red Bird. The rounded trees The barn. The cloth with a red edging, like the curtains in Marjorie’s kitchen, the simple cotton panels hanging from cotton string. Almost as if this project was meant to be. Predetermined. The frisson continues as I write this, and continue to bind my books, slowly. One by one.